Bike Benefits Bingo Recently updated ! We are so excited to introduce the best thing to hit the Charlotte bike scene since Bike Benefits. Charlotte Bike Benefits Bingo! 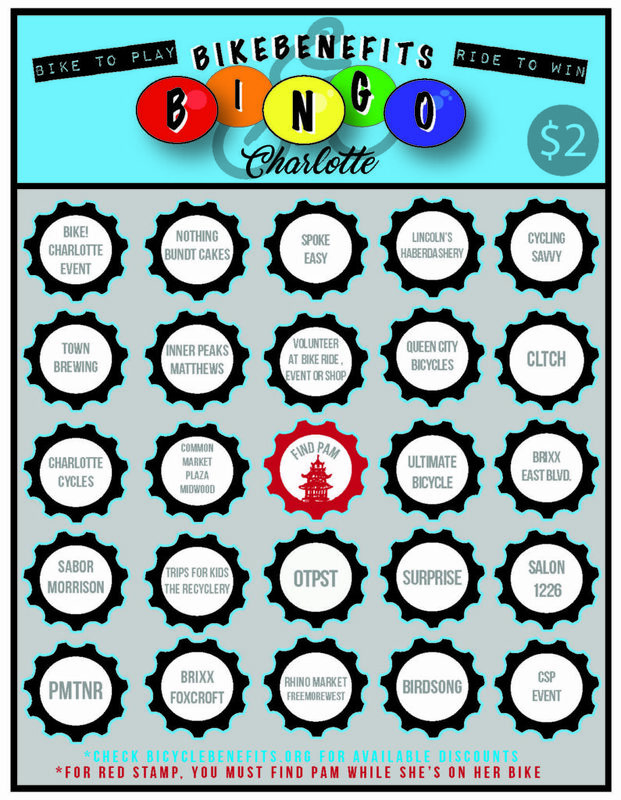 Bike Bingo is a celebration of Charlotte by bike! April 26- May 31, ride your bike, collect stamps and win prizes! Request a stamp at each spot upon showing your Bike Benefits sticker*. No purchase necessary – 1 card per person. 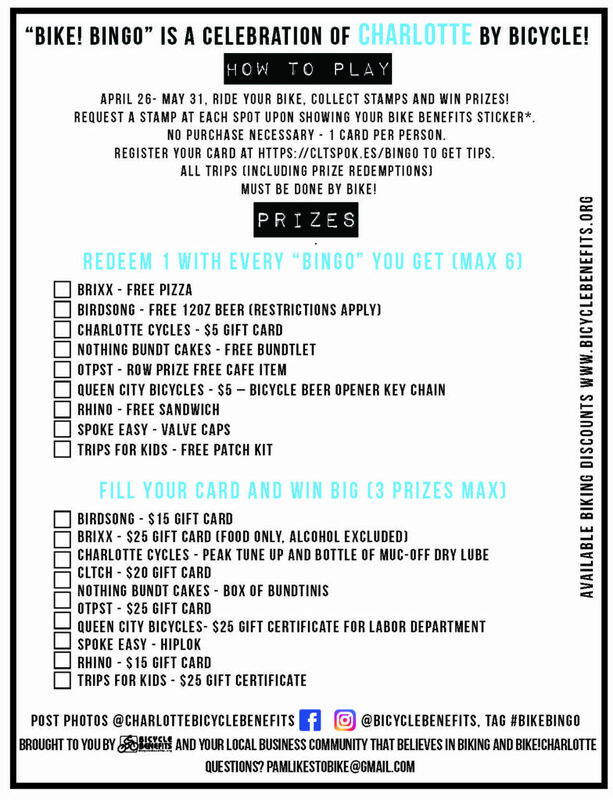 Register your card at https://cltspok.es/Bingo . Prizes redeemable at listed locations. All trips (including prize redemptions) must be done by bike! Where: Pick up Bingo cards at any Bike Benefit business on the card or at special events such as Bike!Charlotte events (Mayor’s Ride and Open Streets 704). Cards will be sold for $2 (or $1 with a Bike Benefit sticker) but a limited number will be available at these Bike!Charlotte events. What: Individuals pick up a $2 Bike Bingo card, then have 5 weeks to bike around the area, attend rides, events and pedal to Bicycle Benefits businesses in order to get their bingo card stamped. Individuals who get 5 in a row or fill their entire card can redeem prizes. All prizes must be redeemed by May 31, 2019. Post photos @Charlotte Bicycle Benefits on facebook, @Bicycle Benefits, #BikeBingo on Instagram.